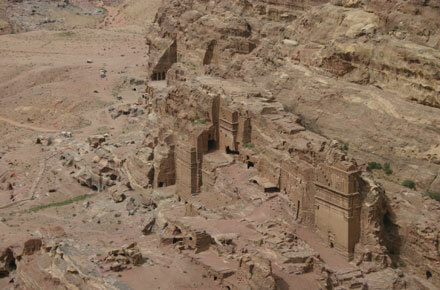 Ancient trade settlement carved from towering sandstone cliffs. 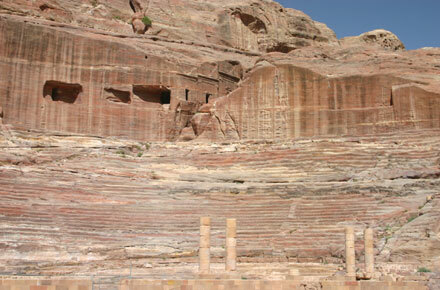 A UNESCO World Heritage Site, described as one of the most precious cultural properties of man's cultural heritage. 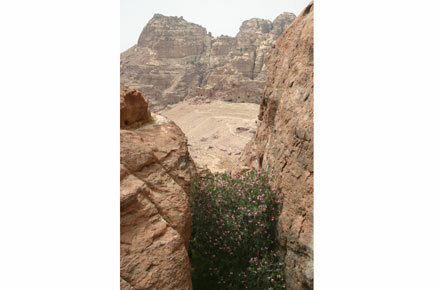 Approach through the famed, timeless Siq (chasm), a metres-wide gorge in the bare, crazed rock leading into the basin. 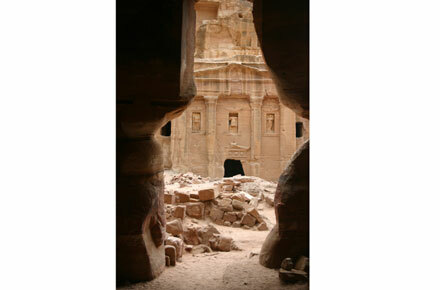 Admire the workmanship of the intricately carved tombs and buildings of this Nabataean stronghold. 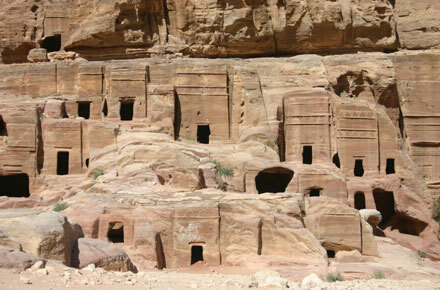 A heroic selection of walks: climb to the High Place and the Monastery, walk in from Little Petra, explore tomb-infested gorges and walk back out via royal tombs and a metre-wide siq. 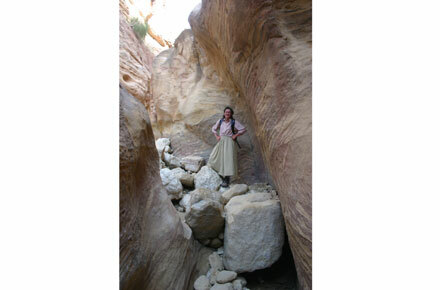 Siqs (slot canyons) are vulnerable to flash-flooding. Be absolutely certain of the weather (both recent and approaching) before entering. 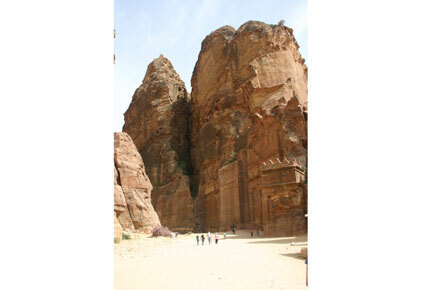 Petra, nestled among towering pinnacles and cliffs of bright orange sandstone, is undoubtedly one of the finest archeological and anthropological sites in the world; a cultural epicentre of the magnitude of Machu Picchu. 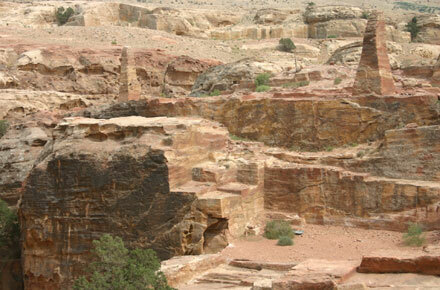 Here is a settlement as fantastical as is conceivable, extraordinary structures hewn from living rock. 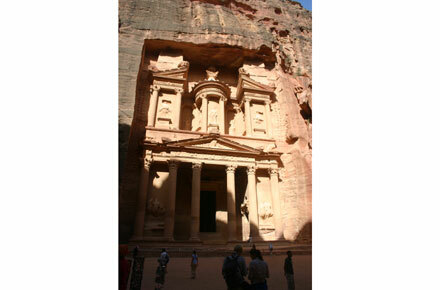 This "rose-red city, half as old as time" [(John William Burgon)] is one of the "new" Seven Wonders of the World and a World Heritage Site. 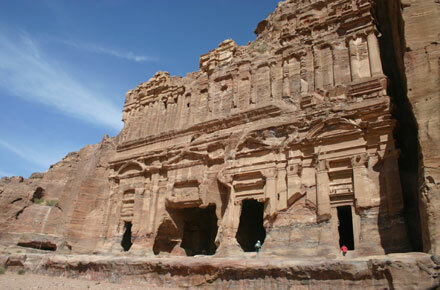 Petra's founders, the still mysterious Nabataeans, were originally a nomadic tribe from Southern Arabia, who become supreme traders along the routes that crossed the area, dealing in frankincense and spices and goods from Africa, their influence extending as far away as Rome. 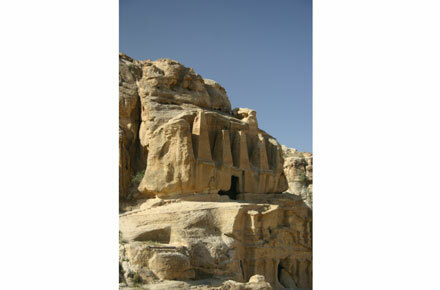 Its ornate, cosmopolitan tomb facades demonstrate influences of Egyptian, Greco-Roman, Assyrian and Byzantine design. 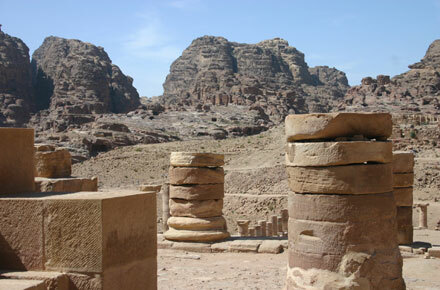 While little is known of their religion, its relics, especially its high places of sacrifice, are all around and are essential to its mystique. 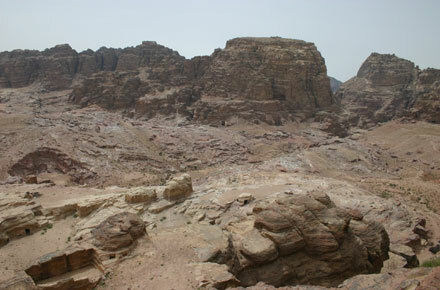 This is a biblical landscape, recorded in the Old Testament: under four hour's trek away is the tomb of Moses's brother, Aaron. 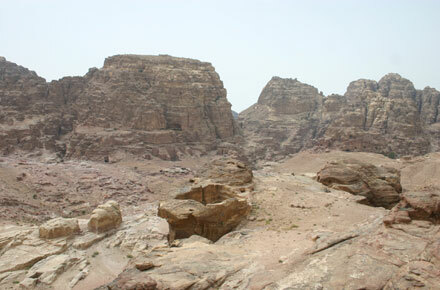 There is some dispute as to whether the city, thought to date from the 6th century BC (and to have continued for a millennium), is actually mentioned in the Bible, but Wadi Musa, the local town, is reputedly built on the spot where Moses struck his staff on a rock and produced flowing water. This reliable water was the source of the city's wealth. 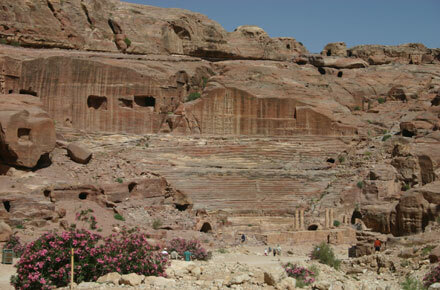 The Nabataeans hived off much of the area's water with a vast network of cisterns and aqueducts, allowing them to dominate this key point on the region's trade routes. 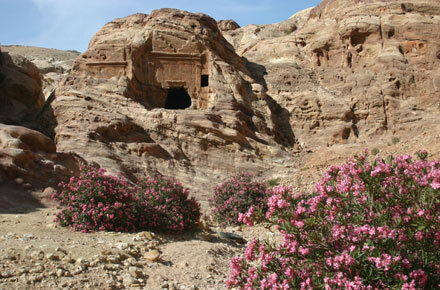 Hidden and protected by its situation amidst impenetrable desert mountains, it grew to both prominence and wealth through trade. 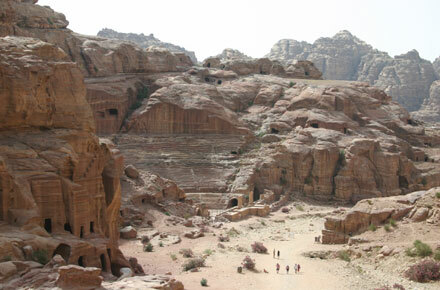 The site (and the nearby Little Petra, in a gorge of its own) is so large and crowded with marvels that one could spend weeks here and not cover it all. 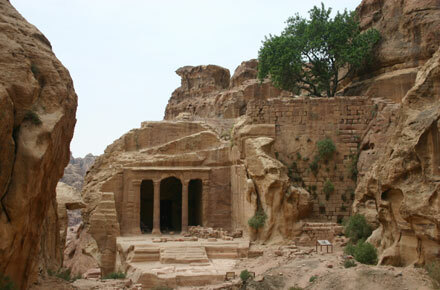 That the Nabateans were admirable engineers is evident not only in the water-courses, but in the very rocks of the city - gargantuan, ornate tombs carved by hand halfway up towering cliff faces, and the High Place: a plateau with a sacrificial altar, overlooking the city, edged by monolithic obelisks carved from the living rock: this can only have been achieved by the wholesale removal of its original peak. Petra's fame - in particular the world-famous, metres-wide siq (gorge), which forms its main entrance, and which opens directly onto the stunning Khazneh (treasury) - indeed, stardom (it is the site of the climax of Indiana Jones and the Last Crusade, among other media appearances), makes it a magnet for tour groups. Fortunately, many of these make it not much further in than the Roman theatre a few hundred metres down the main drag, leaving great tracts of the city, with its Roman central colonnaded street and temples, high monastery (Ed Deir), royal tombs, Byzantine church, mosaics, monuments and myriad other tombs, relatively peaceful. 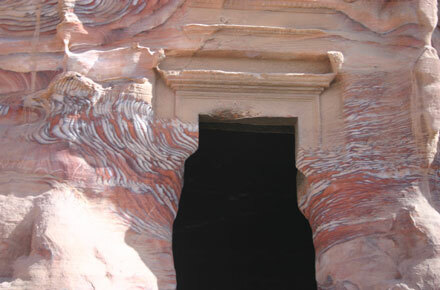 Entering via the Siq, however, and its breathtaking culmination, is an essential part of the experience: beat the crowds by coming in the early morning, or approaching sunset, when the light catches the Khazneh's scarlet sandstone and seems to set it ablaze. 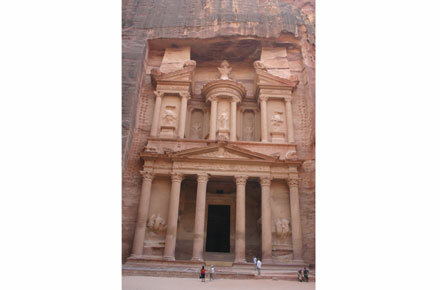 Don't miss the torch-lit "Petra at Night" - but it only happens once every two nights in high season, so plan ahead. 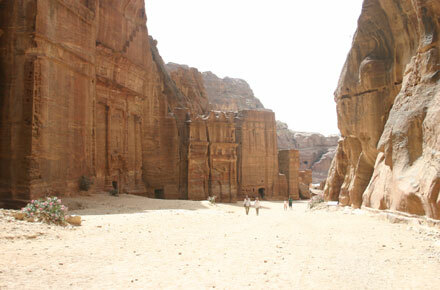 You can spend days walking in and around Petra. 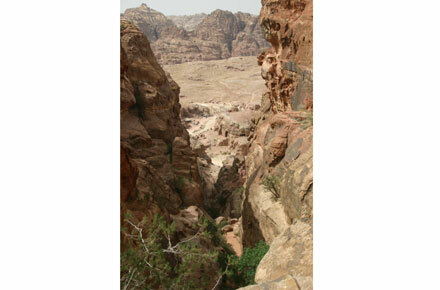 The Cicerone book contains a wide variety of walks, including multi-day hikes. Here are some you must not miss, and others that are more optional. 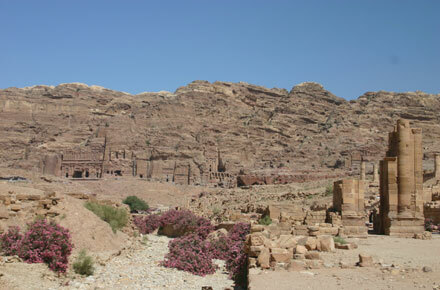 Al Deir (Monastery) Circuit round the mountain behind the famous "Monastery". 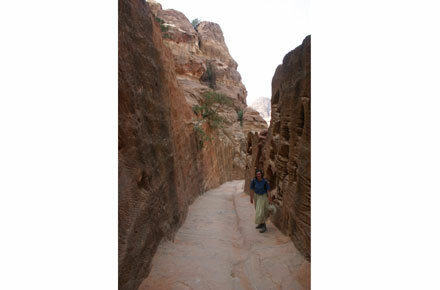 Little Petra to Petra via the Three Valleys. 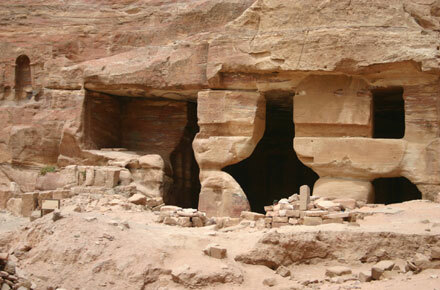 Royal Tombs and Wadi al Mudhlim Siq. This is a fabulous alternative entry or exit route. 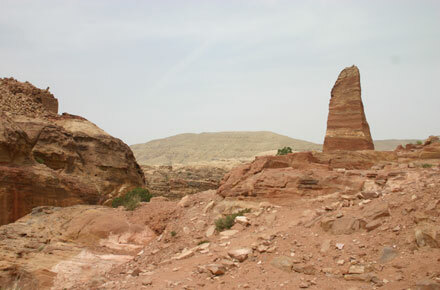 Sabra area . 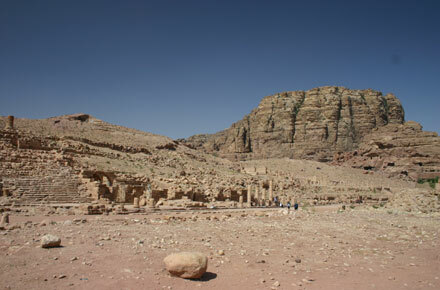 This remote area with a Roman theatre needs two days, camping in Wadi Sabra. 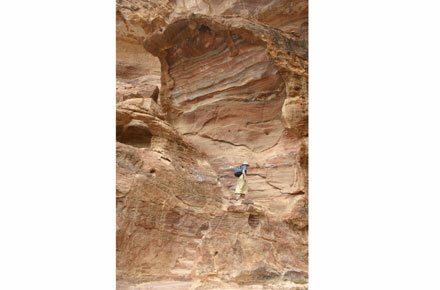 Walk back out along the outstanding Wadi Tibn siq. Wonderful if you have the time; we didn?t get to do it and regret it the most. 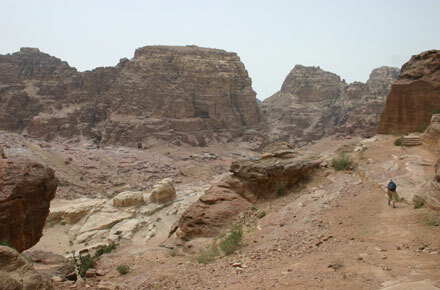 Umm al Biyara, scramble of about 3 hours to mountaintop southwest of Petra on which are the remains of an iron age village. Superb views. 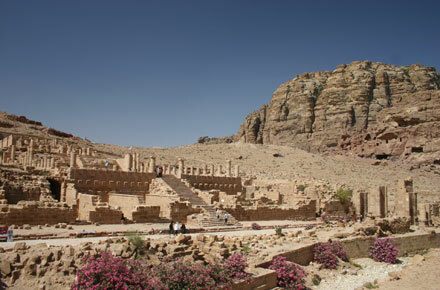 Jebel umm al'Amr: a quite tough slog up via four "High Places" to fabulous viewpoints above the Royal Tombs and onto the Treasury. 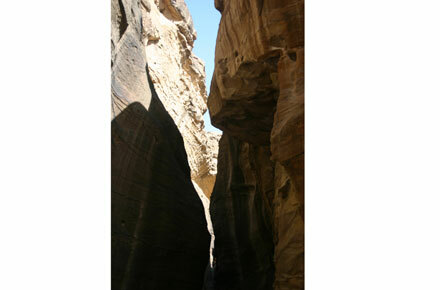 Wadi Siyagh: a long canyon which can be followed as a difficult hike. 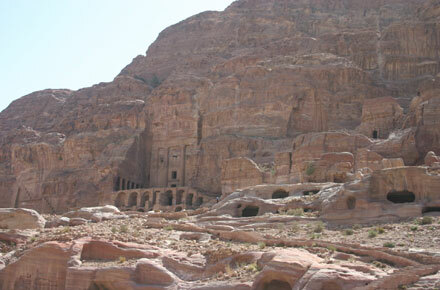 Or, you can wander down some of the way from the Petra basin, enjoying the tombs and open riverbed of its upper reaches. 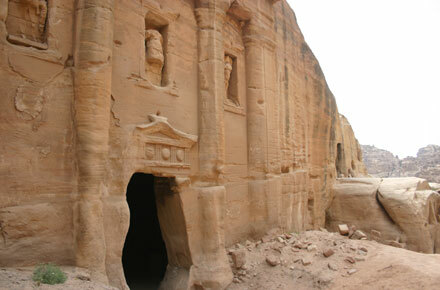 Day 1: In via the Siq and city centre with a guide. 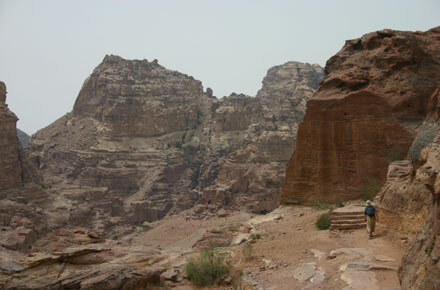 To Ed Deir (the Monastery) and round the mountain on a stunning path, descending beautiful Wadi Muaysra al Charbiyya. 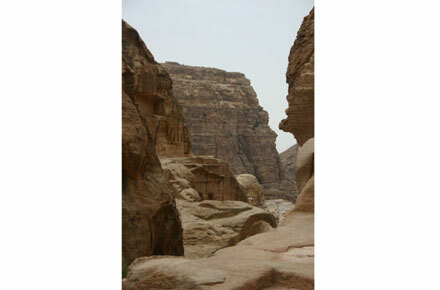 Back out via the Royal Tombs and Wadi Muthlim. 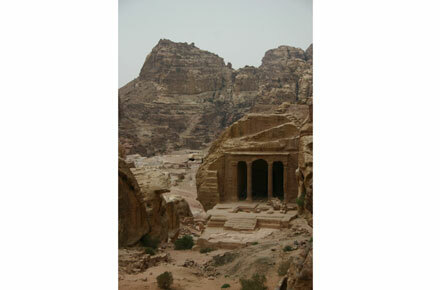 We were in Petra for 9 hours and shattered (it was mid May and very hot). 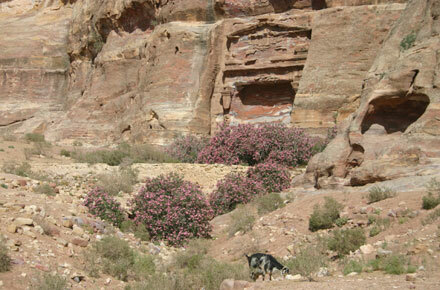 Day 2: Little Petra to Petra via Wadi Muaysra as Sharkiyya, then (after lunch) up and over the High Place. 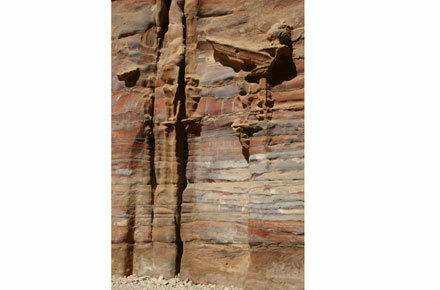 Out, slowly and contemplatively, via the Street of Facades and the Siq. This was another 8 hours but somehow less exhausting. 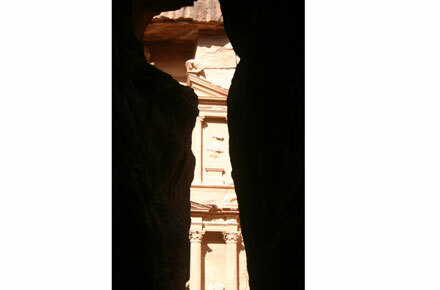 Through the main sites: Siq - Kasneh - theatre - Qasr al-Bint - Roman road -siq. 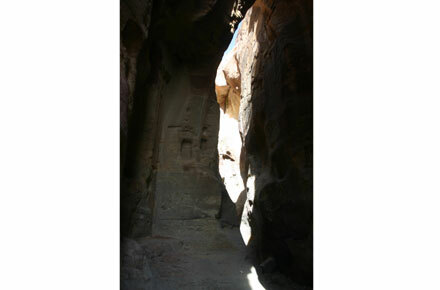 From the visitors' centre, go through the Petra gate (ticket required) and follow the path to the head of the Siq, passing the Djinn blocks, the Triclinium and the Obelisk Tomb. 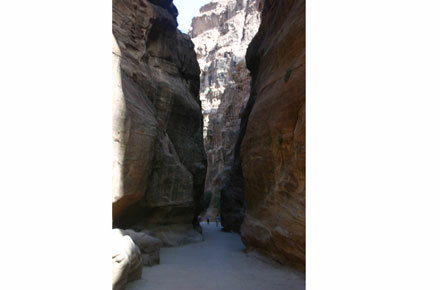 To the right is the Nabataean tunnel cut to carry flash-floodwater away from this main route and through another extraordinary siq (see above). 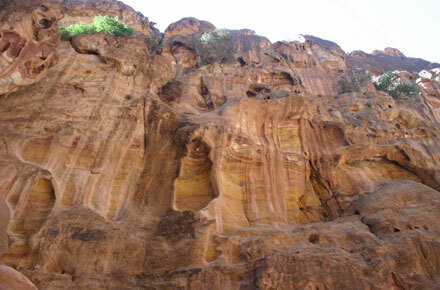 The Siq, a stunning, eerie path between towering, striated sandstone cliffs, lasts a little over 1km, and is peppered with shrines, water-channels, carving and Roman paving (and tourists riding tough little Arab ponies); as you near the end, tiny glimpses of the Khazneh ("Treasury") will begin to show themselves between the rocks, but nothing will prepare you for the shock of emerging and seeing it in its full glory. Allow five minutes for inarticulate swearing, then follow the main drag down the widening canyon. 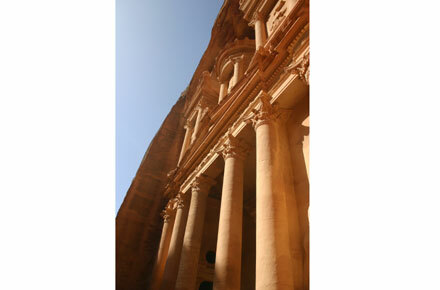 Take time to take in the Street of Facades, Roman theatre and much else. 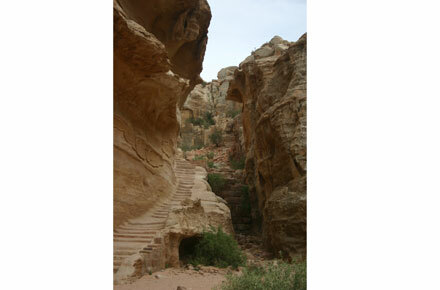 The track up to the High Place (see above) is clearly marked just on the Siq side of the theatre. Then walk, on Roman paving still remarkably intact in places, along the Colonnaded Street, past the Great Temple and the stub of a triumphal arch. Beyond, on the left, are the huge walls and columns of the Qasr al-Bint, said to be the only free-standing building left in the city after the earthquakes of the last two millennia. 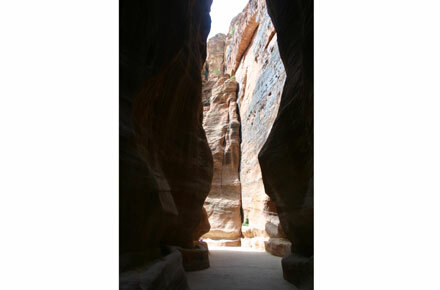 At its end is open space surrounded by more remarkable tomb-filled cliffs; when you've had your fill, return up the main drag to the Siq. 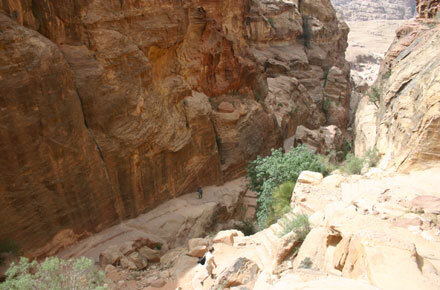 Because of the endless possibilities for small detours into jaw-dropping archaeology, this route is roughly as long as a piece of string, but don't expect to complete it in less than three hours.